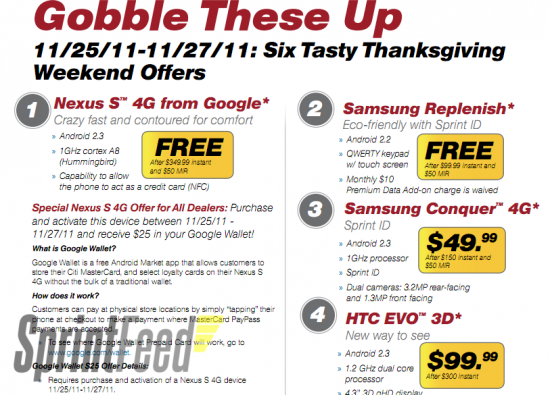 Sprint is getting in on the Black Friday action with a few deals to digest post-Thanksgiving. 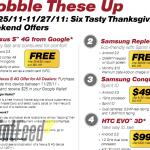 A number of their top smartphones and tablets will see significant price cuts to get buyers in the holiday spirit, including the Nexus S 4G free of charge. Sprint is sweetening the pot by throwing in $25 of Google Wallet credit along with a Nexus S purchase. Other deals include the HTC EVO 3D for $99, the HTC EVO View 4G for $249.99, and the Samsung Conquer 4G for $49.99. All prices come after rebates and require new line activations with two-year commitments. The deals begin November 25th and run through the 27th of the month.